This giveaway is now CLOSED. Thanks so much to our wonderful sponsor ZIPZ shoes! We look forward to working with you again! The winners have been notified and upon confirmation, follower names will be posted both here and on our homepage. Remember: There are great giveaways active on the upper right hand side of the page! When you were young, what was your style? Is your style the same now? Adults, teens and children may have very different ideas when it comes to back to school shopping. While mom wants durability, children want popular style and teens just want to be unique and wear something that reflects their own personal style. If you could find footwear that was versatile, durable and definitely in style, footwear that is actually both toddler, kid, teen and adult friendly you'd snap it up in a heartbeat right? Whether you are shopping for your skater boy, girly girl, urban cool, a preppy teen or somewhere in between, Zipz is your footwear solution! 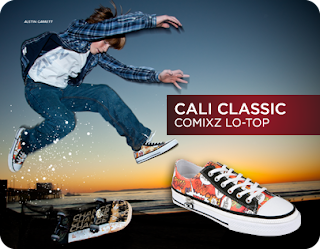 ZIPZ® are removable and interchangeable shoes, like nothing you’ve owned before! Match any ZIPZ® COVERS with any same size ZIPZ® SOULS to create one of-a-kind mix and match shoes. Ƹ̵̡Ӝ̵̨̄Ʒ - Handmade to ensure comfort, quality, and reliability. Ƹ̵̡Ӝ̵̨̄Ʒ - By purchasing soles and tops separately you can basically match any top to any bottom creating a endless amount of shoe combinations. - While your child or teen may eventually outgrow their original sole size, I can assure you that they will NEVER get bored as there are a wide variety of covers in a great assortment of styles and colors! Ƹ̵̡Ӝ̵̨̄Ʒ - Soles sell for $19 and covers sell for $34. 'Cambio tus Zapatos' means Change Your Shoes! Aren't these cool? Ƹ̵̡Ӝ̵̨̄Ʒ - There are Zip-Ons, Lo-Tops, and Hi-Tops styles. and there are also Toddler T-Strap and Toddler 2-Strap styles available! Aren't these Spiderz Toddler 2 Straps just too cute? I am a horror movie buff, and I so want these for Halloween! Me and my nephew are going to look too cute in our matching Halloween Sneaks! It takes a bit to get the hang of changing out the covers and I found it easier to put my foot on the sole first, and then zip myself in rather than zip it first and try to get my foot in (but that's because I'm wide width), but once you figure out which technique works best for you, you will be swapping covers every day! Ƹ̵̡Ӝ̵̨̄Ʒ - WIN IT! - Ascending Butterfly and our friends at ZIPZ have a very special surprise for 2 lucky winners! 2 winners will receive a completed pair of zips in their choice of style and size based on in stock availability. You can opt to select a pair for yourself, your toddler, youth/child, or teen, the choice is yours! Don't you just ♥ Zipz? I know I do! Ƹ̵̡Ӝ̵̨̄Ʒ - How to Win: (1) You must be a PUBLIC follower of Ascending Butterfly to be eligible for this and all giveaways. Indicate in your entry that you follow (if your 'comment name/user id' differs from your profile id, please let me know what name you follow under) and (2)MANDATORY- Visit ZIPZ and let me know which sole style and cover you would pick! (3) You must also leave your email address somewhere in your comment. (You can format it this way for security, example: ascendingbutterfly AT mail host DOT com). (If your email is clearly visible in your profile, you can just say so, that's OK!) Please follow the easy 1, 2, 3 steps to winning (or in this case, the A,B,C’s of winning!) This giveaway is open to USA who are 18 years of age or older. No PO Boxes. One entry per Household, see Ascending Butterfly Giveaway Rules and Disclosure Policy HERE. Ƹ̵̡Ӝ̵̨̄Ʒ - Are you on Blog Lovin? Well so is Ascending Butterfly! Follow us on Blog Lovin for an extra credity entry! My daughter would flip of the SkullRose Design. I could possibly win "favor" with my pre-teen that is going through that "my mother is a complete embarrassment phase"
I follow/like Zipzshoe on Twitter- DanelleJohns. I follow/like Ascending Butterfly on Twitter- DanelleJohns. I would choose the Pink Camo Youth Hi-Top Shoes With White Soul/Black Sport Stripe. I'd choose the adult lo-tops Ruby Heartz. Awesome shoe. I follow you on GFC(kellyr78) and I would choose the Denim Blue youth low tops for my son. What an interesting concept! I like the Comixz cover with White w/ black stripe sole! I follow on GFC and I'd get the Cranberry Lo-Tops. I've entered the Hannah Handbag giveaway. I like the Toddler 2 Strap Flamez w/the White & black Souls, so cute!!! ((1955nursehjc4me(at)myway(dot)com)) TY! I follow (HollyCunningham) via Networked blogs!!! ((1955nursehjc4me(at)myway(dot)com)) TY! I left a comment on yr "Sephora" post dated 08/16/11 ((1955nursehjc4me(at)myway(dot)com)) Thanks! I used to gfc follow and I cant verify because GFC is down. I like the youth low tops in spiderz. Follower, I love the SkullRose ones the best, thanks for the chance! I'd choose the youth HIPEEZ they are so adorable. I follow GFC. I'll take the Dragon Rose Adult Zip-On Shoes With White Soul/Black Sport Stripe. I follow with GFC (mail4rosey) and I Like the Army Camo toddler Zipz. I would choose the Jet Black in the Youth. I liked Zipz on facebook. I would choose the DRAGON ROSE Adult Low-Tops. Follower via GFC as Jennifer Azbill. My favorite style is ruby hearts, for sure.